Management has recently approached AFA regarding their desire to negotiate a co-terminal agreement for the SFO domicile. Alaska Airlines currently operates a co-terminal agreement at LAX, which allows pairings to be built to begin and end at co-terminal airports through the Los Angeles metropolitan area. If adopted, an SFO co-terminal agreement would allow a similar arrangement for pairings to begin and end at co-terminal airports throughout the San Francisco Bay Area. Why Negotiations? Can’t Management Just Open Co-Terminals? Though management retains the right to open and close domiciles at their discretion within the guidelines spelled out in the collective bargaining agreement, co-terminals are not domiciles in themselves but rather additional airports that are part of a single domicile. There is no contractual mechanism that allows management to add additional airports to a domicile, therefore an agreement must be negotiated. The voting members of your Master Executive Council (MEC), consisting of the six directly-elected LEC Presidents, have approved the creation of a special negotiating committee to negotiate a co-terminal agreement with management. The committee will consist of three Negotiating Committee Members who will be selected by the MEC. The MEC President serves as Chairperson of the committee per the AFA Constitution & Bylaws. Although a co-terminal agreement would certainly effect Flight Attendants based at SFO, it would also have a further reaching impact throughout the system. With more trips being able to begin and end at co-terminal airports, there would likely be a reduction in layovers in these locations. The systemwide distribution of flying would also be impacted as co-terminal airports would begin accommodating pairings built out of those locations. For this reason, the Special Negotiating Committee positions are open to Flight Attendants from all domiciles. The Special Negotiating Committee will negotiate an agreement for co-terminal airports to be added to the SFO domicile. a. The Committee, with the advice of the Staff Negotiator shall have the authority to conclude an agreement, subject to the provisions of Article XII. of the Constitution and Bylaws. c. Committee members shall be familiar with Union policy and keep abreast of new developments in the industry. d. Committee members shall utilize the facilities and resources of the Union and the experience and knowledge of Union Officers, International Office staff and study committees of the Union. (e.g., Legal, Retirement and Insurance, Wage and Working Conditions, etc.). (1) Financial condition of the company. (2) Management lines of authority and methods of communication. (3) Operations statistics and experiences of the airline which may be used in bargaining, grievances, litigation, etc. f. Committee members shall be familiar with the wishes of the flight attendant group with respect to wages, working conditions, and work rules, through, for example, system-wide distribution of contract surveys, periodic road shows, etc. g. The Committee, with the advice of the Staff Negotiator, shall prepare the contract opener. h. The Committee shall provide regular updates to the membership on the status of negotiations through, for example, newsletters, hotlines, telephone trees, etc. i. The Committee shall maintain a complete record of the negotiations, including proposals, notes and communications, and such record is the property of AFA-CWA. A copy of this record will be forwarded to the International Office by the Negotiating Committee. Appointed by the AFA Alaska MEC and terms are served to completion at the approval of the MEC. Takes direction from the chairperson of the Special Negotiating Committee (i.e. in this case the MEC President) with input from the AFA International Collective Bargaining Department (i.e. staff negotiator) and Legal Department (i.e. staff attorney). After successful ratification of the SFO Co-Terminal Agreement will continue to serve as a contract interpretation resource for the agreement. Maintain a complete record of negotiations including proposals, notes and communications. Such record is the property of AFA-CWA. Public interactions (including social media) must reflect favorably on AFA Alaska. If requested by AFA Alaska, Special Negotiating Committee Members must be willing to reasonably limit social media interactions for the duration of preparation, negotiations and implementation. Interested candidates should submit an expression of interest letter and resume to MEC Secretary-Treasurer Linda Christou at linda.christou@afaalaska.org. Why do you believe you are a good candidate for the position? What is your understanding of the LAX co-terminal agreement that is currently in place? The deadline for applications is Friday, February 1, 2019 at 5 PM Pacific time. Linda will contact applicants to coordinate an interview with the MEC and arrange travel (if necessary). Interviews will be held at the AFA MEC Office in Seattle, WA on Wednesday, February 13, 2019. Any questions regarding Special Negotiating Committee positions should be directed to MEC President Jeffrey Peterson at jeffrey.peterson@afaalaska.org. In accordance with the AFA Constitution & Bylaws, your new Local Council will soon nominate and elect Flight Attendants as your AFA Leaders. The two (2) positions being elected for Council 35 (Virgin America–JFK/LAX/SFO) are Local Council President and Local Council Secretary. The current Local Council Officers who were appointed when the Local Council was created will transition responsibilities to the Flight Attendants who are elected to these two positons. The Council 35 Election page can be found at http://afacwa-elections.org/councils/ala-council-35-sfo-lax-jfk/. Within AFA, Local Council Officer elections are a two-part process. The first step is to nominate candidates for office from amongst the Flight Attendants at your Local Council and the second step is to elect officers from the nominated candidates. This communication will focus on the first step, the upcoming nomination process. Mail Date 06/19/2017 Voting packets are mailed to each Flight Attendant. This contains your personal 16-digit activation code. 12:00 PM EDT The polls are open and voting begins. 12:00 PM EDT The polls close and the count takes place. Both the nomination process and election ballots are conducted through Votenet Solutions, a third-party vendor. The direct web address is https://eballotuv.votenet.com/afa/. The AFA Election site at http://www.afacwa-elections.org/ will address additional questions and provide information regarding the ballot. For the nomination ballot, the process is conducted completely online. You will be nominating your elected leaders from a list of all Flight Attendants in your Local Council. For the election process where you will be selecting leaders from those nominated, ballots may be cast either online or by telephone. All Council 35 Flight Attendants will receive a voting packet by mail. This packet contains the instructions for casting your ballot along with a 16-digit activation code which allows you to access the ballot. If you have already completed an AFA membership application, you will be able to log into the ballot, select your choices for the two positions and cast your vote. If you have not completed an AFA membership application, you will not be able to cast your vote right away. You will need to contact AFA Membership Services in order to complete your application and have your ballot activated. The voting packet includes a 16-digit authorization code. This code allows you to obtain a username and password which is your voting credentials for that ballot only. This ensures that no one at Votenet or AFA has access to your voting credentials. New activation codes are sent for each and every ballot. The site will generate a username and ask you to create a password. Once a Flight Attendant obtains their username and password they may proceed to vote. The AFA-CWA Membership Services Department handles all voter questions and issues new activation codes should you misplace yours. The Ballot Help Line is staffed Monday through Friday from 9:30 AM to 5:00 PM Eastern time. If you have a question or need a new 16-digit activation code, you may contact the Ballot Help Line at 800-424-2401, then press 1 and dial extension 706. If your call goes to voicemail, please leave a message and someone will call you back. The ballot will end and no additional votes may be cast after the end date and time listed on the Voting Instructions. The time will always be listed as Eastern time, NOT your local time. The opening and closing dates of the ballot are set in accordance with the AFA-CWA Constitution & Bylaws. The counting of the electronic ballots is conducted in accordance with the AFA Constitution & Bylaws by the Ballot Certification Committee. Each person who has completed a Commitment to Serve and received at least 2 nominations will appear on the election ballot. Each Flight Attendant who wishes to run for office must complete a Commitment to Serve (http://afacwa-elections.org/commitment-to-serve-form/) in order to be eligible to appear on the election ballot. 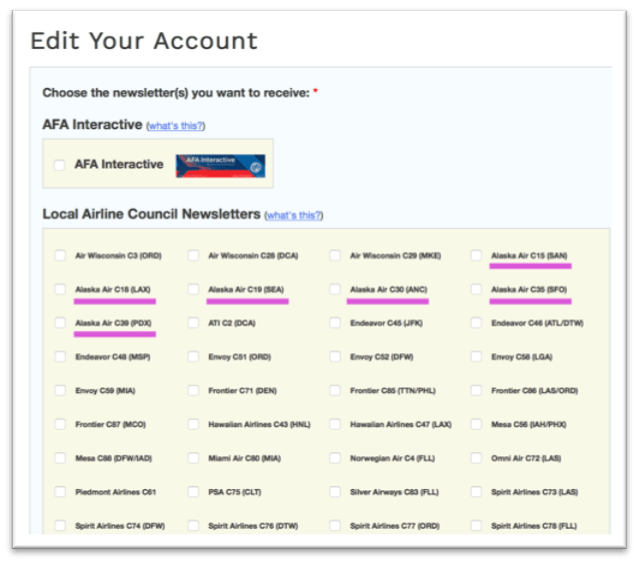 If a Flight Attendant receives two nominations and has not completed a Commitment to Serve, AFA Membership Services will contact those people on the count day and allow them to complete the form. Q: Who receives the Voting Notice and Instructions (Ballot Packet)? A: All Flight Attendants in your Local Council will receive the voting packet including Flight Attendants who have not completed a membership application. Q: If I change my mind after I cast my ballot, can I revote? A: No, once you cast your ballot your credentials are separated from your vote. This way no one can see how anyone casts a ballot. Q: Can a person who has not completed a membership application vote? A: No. They will receive a voting packet but if their membership application is not on file then they will be stopped from casting a ballot. However, you may contact AFA-CWA Membership Service to complete a membership application and once completed you will be eligible to vote. Q: Who do Flight Attendants call if they did not receive the Voting Notice with the 16-digit authorization code? A: The AFA Ballot Help Line at 800-424-2401, press 1 and dial extension 706. The Ballot Help Line is staffed Monday through Friday from 9:30 AM to 5:00 PM Eastern time.